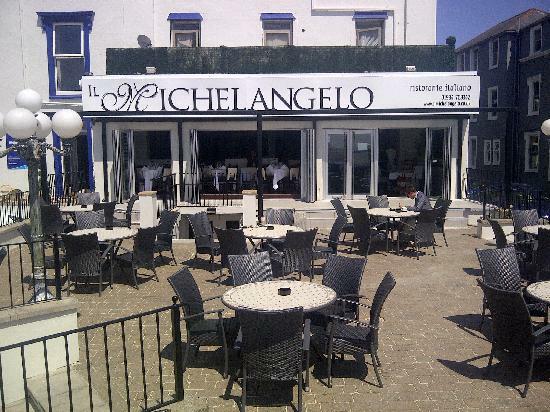 I went to a restaurant called The Michelangelo this past Sunday for lunch. I’m not one for having roast dinners so I would prefer not to go to a British food establishment. I’ve always been a fan of Italian food anyway so it made a nice treat. The restaurant happened to be on the Weston-Super-Mare seafront and had just recently opened. From what I had seen driving past it looked very nice from the outside, the weather has been great these past few weeks and the sun umbrellas were out. When I walked up to the premises on Sunday, I felt slightly under-dressed as the waiters and waitresses were all looking very smart. We walked up to the bar and asked to be seated. The menu had a wide range of pasta, pizza and other Italian classics such as meatballs and Lasagne. My partner Riggs chose Salmon to start with and Lasagne for main whilst I chose the antipasto starter and a calzone pizza. The antipasto turned up, I can’t get enough olives and bread especially when you have the added bonus of meats thrown in. The thing about antipasto is although it is delicious, it doesn’t take much preparation. A tasty first course none the less, there were three different types of meat, Salami, Parma ham and another with the consistency of Billy bear ham. The olives and meat were delicious as well as the little bit of salad drizzled in olive oil. When my main arrived I was ready to eat a house. As the waitress walked towards me I realised how wrong I was about that statement.. The Calzone was surprisingly big, with a large helping of a tomato purée sauce on the side. I cut through the crispy exterior into a large area of soft cheese and ham, dipped into the tomato and then put it into my mouth. absolutely delicious. I ended up leaving one of the crispy corners as my body could just not handle any-more food. I would definitely recommend this restaurant, fantastic.